Beat Hazard Ultra looks fantastic, with its neon explosions and swirling backgrounds, and sounds – well, it sounds as good as your iTunes library. Which in my case is excellent, I’ll have you know. Here’s the twist: the soundtrack you choose is used to generate the on-screen action. More going on aurally means more going on visually, affecting the enemies, your firepower, and the backgrounds. Volume power-ups heighten the effect, and there are others to increase your multiplier, smart bombs and so forth. The action matches the music enough to convince, but not too much to hamper the game. There’s a lot of fun to be had just playing around with different types of music; Girls Aloud work fantastically, Fanfarlo less so. There’s a choice of single and twin stick control. Shooting is automatic with a single stick, leaving you to duck and dive – but mainly just enjoy the visualisation effects, as the auto-firing is fearsomely accurate. It’s inevitably a more challenging beast with twin sticks. Either way, the virtual controls are surprisingly unproblematic; it’s hard to quantify exactly what makes them work where others don’t, but they’re responsive, accurate and unobtrusive. They need to be, too, particularly for the boss enemies. The pace varies hugely, not always entirely based on the music, but at times you’re faced with a screen full of hell. Which, as every gamer knows, is a good thing. 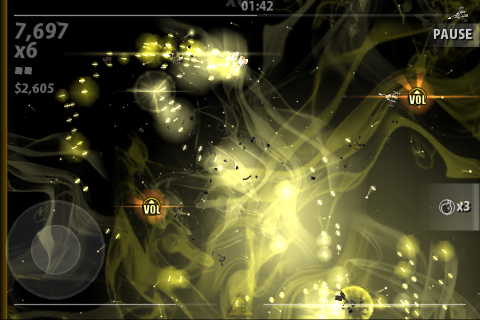 It’s a fun visualiser, then, but also a very nice shooter. And all that by one man UK studio Cold Beam Games. Ludicrously impressive stuff. I can’t imagine this making the Cheeky Girls any more pleasurable to listen to, Jake.